I debated posting about this pie. It was appetizing and delightful, but it wasn't what I was expecting. Unfortunately, I think it turned out differently then expected because of human error. Don't get me wrong, it was eaten with gusto, but I was anticipating carmel. The carmel was lacking. I'll go into greater detail later about what went wrong. The recipe came from the cooking channel. There are two things I particularly liked about the recipe. You slice the apples very thinly. They suggest using a mandolin, which I do not own. I think this makes a prettier pie and allows you to stuff it with more fruit. I also like how they drench the apple slices in lemon juice. The lemon juice not only prevents browning, but the lemon balances the sweetness of all the sugar. 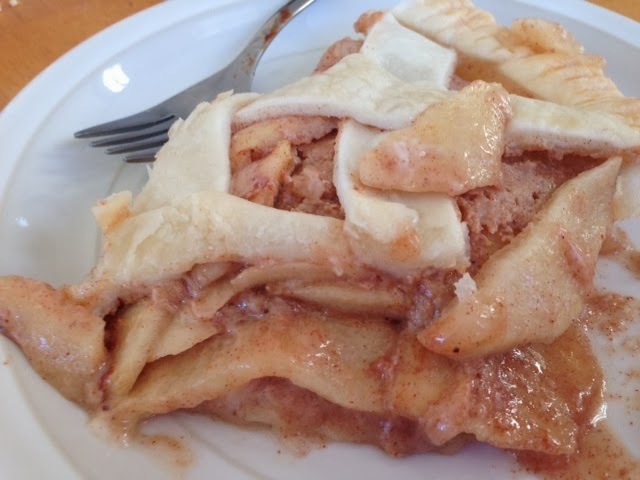 The ingredients are 2 pie crusts, 1 1/3 cups sugar, 1/4 cup water, 1/2 cup butter, 1/2 cup heavy cream, 1/2 teaspoon salt, 4 tablespoons pumpkin pie spice, 4 lemons, 5 apples, and 2 tablespoons flour. I added one cup of sugar and the water to a pot. I heated until the sugar had de solved. The first mistake I made was stirring the sugar water. I should have just let it sit unmolested. Sugar crystals formed on the side of the pan and on the spoon. It made a crunchy, unappetizing crust. Once the sugar had de solved, I added the butter. I heated this until it had browned. This was when my second mistake occurred. The recipe states to cook until it becomes a copper color. I am confident I didn't let the sugar cook enough. Once a nice copper color, add cream. This is supposed to bubble vigorously, but my carmel sauce did not bubble vigorously when the cream was added. It wasn't thick either. I made carmel again today, and it turned out much better. I cooked the sugar until it was nicely golden brown before adding the cream.I didn't stir until I added the cream. You don't want to burn it, but you also need to cook it long enough. Very tricky! I think I need made carmel a few more times to master it. I removed the sauce from the heat and added the salt and one tablespoon of pumpkin pie spice. While the carmel was cooking, I prepared the apples. I pealed and sliced them thinly. I then completely submerged them in the lemon juice. I didn't let them soak. After a good soaking, I placed them in another bowl. I combined the remaining 1/3 cup sugar, 3 tablespoons pumpkin pie spice, and flour. I sprinkled this over the slice apples. I would like to say this is a homemade pie crust, but it was purchased from the store. I layered a third of the apples on top of the bottom pie crust. I then pour a third of the sauce on top of the apples. I repeated this two more times. I ended up with a layer of sauce on top. I made a lattice with the top crust. 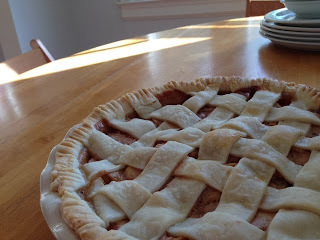 I used from cream to securely fasten the lattice to the bottom crust. I crimped the edges together with a fork. Prior to placing the pie in the oven, I brushed cream on the crust. You bake the pie for 20 minutes at 375 degrees. After 20 minutes you reduce the heat to 350 degrees and bake for an additional 25 to 35 minutes. If the crust is browning too quickly, feel free to cover the top loosely with tin foil. This is a pretty little pie, and even though it didn't turn out exactly as planned, it was delicious. The original recipe uses sea salt, which would have been good too.